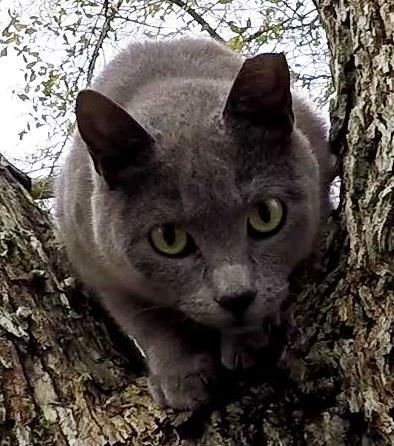 I love to rescue friendly cats, and from what I heard about Gray beforehand, I was hoping that this would be one of those cases. 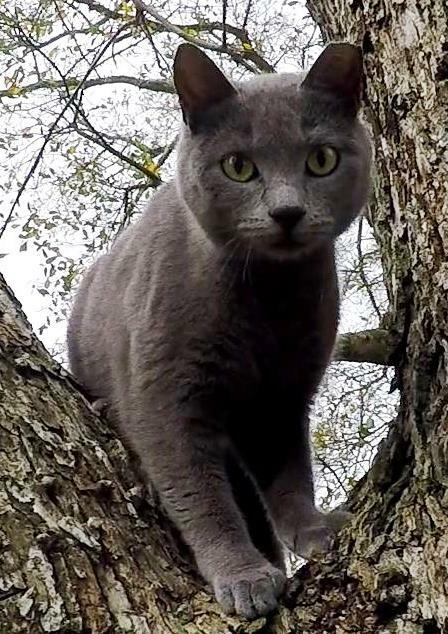 Gray is a sweet, one-year old Russian Blue cat, and she had been stuck in a tree for two nights. When I arrived at the site, I found her about 20 feet high, but was told that she had originally been several feet higher. She cried for help to us below, and appeared to be a friendly girl. If she stayed friendly when I climbed up to her, then this would be an easy rescue. When I set my rope in the tree above her, she was very comfortable with the activity. She even played with the rope as it passed by her. That was a very good sign, and I knew that she was very likely to be cooperative. Sure enough, when I climbed up to her, she happily greeted me and let me pet her. When I pulled myself up even with her, she even stepped onto my lap. For a moment, I even considered bringing her down in my lap, but she was a little bit too energetic and unsettled for that. I opened a can of food, and she responded impatiently to that by stepping onto my lap again to reach it before I was ready to give it to her. I dumped the food into a bowl and gave it to her, and she immediately started eating. I put the bowl of food in the back of the carrier and held it up to her with the opening facing her. She did not hesitate at all to go inside and finish her meal. All I had to do was close the door and bring her down. Sweet, friendly cat. Easy rescue. I love those. Aimee, Gray's owner, was very relieved to have Gray down safely again, and very grateful to me for getting her there. 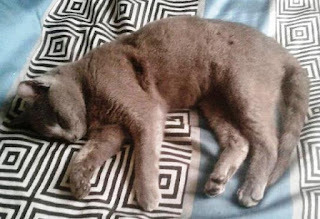 After Gray got readjusted back at home again, she settled in for some much needed sleep, and Aimee snapped this picture. Get some rest, Gray. You need it.